Construction, Surety, Government Contracts, General Commercial Matters, Real Estate, Professional Liability, Employment, and Family Law. • Of Counsel, McManus & Felsen, LLP, Washington, DC. 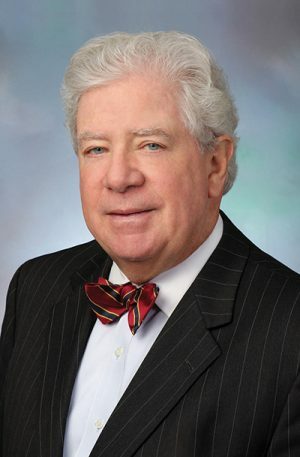 • Former Partner, Duane Morris LLP, Washington, DC. • Mediation Panelist, U.S. District Court for the District of Columbia. • Former Assistant U.S. Attorney for the District of Columbia. • Fellow, American College of Trial Lawyers (2000). • Past Chair, American Bar Association, Forum on Construction, Division 7. • Past President, U.S. Attorneys Association for the District of Columbia. • Founder and Team Leader, Georgetown/NITA Basic Trial Advocacy Program (1978-2003) and Current Co-Director, NITA Advanced Trial Advocacy Program, Washington, DC. • Former Adjunct Professor of Construction Law and Criminal Trial Practice Law at Georgetown Law Center, 1980-2000 (Recipient, Paul R. Dean Award, Georgetown Law Center, for service to Georgetown). • Listed 2009- present, Chambers USA: America’s Leading Lawyers for Business in its listing of leading construction lawyers in the District of Columbia. • Listed, Best Lawyers in America and Martindale & Hubbell, AV rated. • Admissions: District of Columbia, Maryland and Virginia.